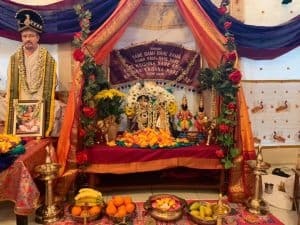 Sri Poornimaji took Houston devotees to Pandharpur through a 3-day discourse series titled Chala Pandharila Javu! The topic for the first day’s Katha was “Nama parathey sadhana nahi”. 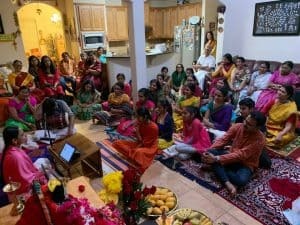 This discourse was held at Jalaram Sai Baba Mandir in Houston and was hosted by the Gajanan Maharaj America Devotees Parivar. 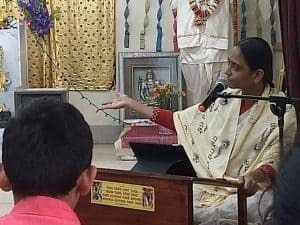 Here Sri Poornimaji spoke about the greatness of the Divine Name through the stories of various Panduranga devotees, especially Sant Janabai and Sant Jnaneshwar. On the second day, the theme was “Sant padache jod dere Hari” or Sadhu Satsang Mahima. 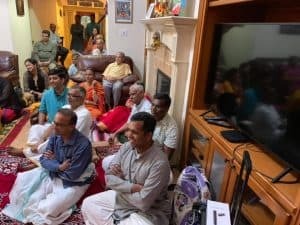 The Katha was held at the residence of Smt. Akila and Sri Chander ji. 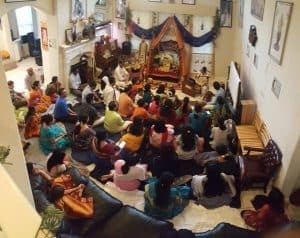 Speaking on Sant Tukaram’s charitram (as it was also around the time of Tukaram bheej or the day he went to Vaikunta), Sri Poornimaji emphasized on the greatness of Mahatmas, the value and importance of Satsang with sadhus, and how the most important prayer is for us to always have Satsang. On the third and final day of Katha, which was held at the residence of Smt. Lekshmi and Sri Jeevan Nair, Sri Poornimaji spoke on “Guru ha premache agar”, i.e. Guru, the storehouse of love! 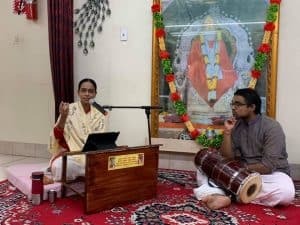 Enunciating the importance of a Guru and the role he plays in our lives, she elaborated on the story of Sant Eknath, who was a great Guru bhakta. Such a Guru bhakta that, being pleased with his Guru bhakti, Bhagavan Himself served Eknath as his disciple for 12 long years! Sri Poornimaji’s katha series left all devotees wanting for more. She beautifully interspersed the Katha with lovely abhangs by numerous Panduranga devotees and truly transported all the listeners to Pandharpur! On the last day, after the Katha, devotees dressed up as Maharashtrian devotees and celebrated the Dindi Yatra to Pandharpur on the street while singing Vittala’s Names, just as devotees in Maharashtra do during ashada ekadasi. 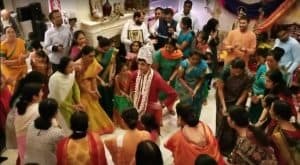 This was followed by an energetic Divya namasankirtan where men and women devotees took turns to dance around Lord Panduranga and Guru Maharaj, while abhangs and songs on Vittala were sung.